Goodbye fake-spring of January, it's been real! February's here with a reminder that it is indeed still winter. Friends in the Northeast, I know you didn't get a chance to forget that; I hope you've all stayed safe and warm! Although I would happily take more non-winter days, I'm not upset about pulling out this thick, warm sweater again. I was glad to find this sweater at Gap; I knew I wanted one that would be nice and cozy, and with a little texture too. My favorite thing about it is the color: rich burgundy with a hint of plum. It's one of my favorite toppers for my current winter uniform of sweater + chambray + skinny pants/jeans. Have you been piling on the layers lately too? Ohh now doesn't that snow look fun?! Hahah. Glad you have some good sweaters to layer up, and at least you got to enjoy a bit of spring before the return of winter at it's finest. Yes, it got cold here again today too! Definitely needed a sweater and a scarf! I really like your maroon sweater, looks great layered over the chambray! Ha, thanks Lydia! :) I know the spring-ish weather was quite a tease. Now time for all the layers! Thanks Beth! I guess the nice weather in winter can only last so long right? One of the many reasons we're blogging buddies... just did a post for next week with my recent chambray layering :) Such a great way to add warmth and style to an outfit, of course. Love the rich color you've got on top and the pop of leopard on bottom. That sweater does look cozy and that second picture of you is actually really cute--but you look so cold. It's been strangely warm here and I've been hoping for a bit more snow for the kids to play in. Great minds, right? 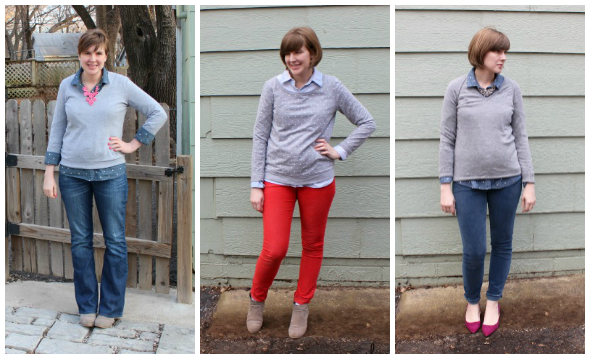 :) I can't wait to see your post for more chambray layering ideas! I don't see myself tiring of chambray anytime soon! Thanks Megan! I was pretty chilly--my own fault for baring my feet/ankles! I changed into boots when I just couldn't take it any more, ha! It had been warm here too before this weekend, and we've hardly gotten any snow either. So strange! Winter has returned to Minnesota, as well. Brrrr! I love your sweater. So cozy. That plum shade looks gorgeous on you! Thank you!! Bummer--we just couldn't avoid it forever, could we? Stay warm! Very cute, I love the color of your sweater! Thanks Linda! Oh the snow...sigh. We haven't gotten too much this year (so far) though, I can't complain.